THIS POST IS A CONTINUATION OF POST DAY 59. The word manipulation is connected to many dimensions and reactions within myself. Through self-forgiving I will ‘debunk’ this connection in order to ‘reset’ this connection and make sure I do not react to the word but hear it for what it is, a word with a defined meaning I understand. The practice of manipulating or the state of being manipulated. The dealer’s manipulations could have removed cards from the deck. The skillful use of the hands in, for example, chiropractic. After a few minutes of manipulation each week, she obtained days of relief from her neck pain. The management of some situation, especially for one’s own advantage. He found that the new manager was known for his Machiavellian manipulations in his last two positions. The usage of psychological influence over a person or situation to gain an outcome. The counselor was able to reach the disturbed teen through positive psychological manipulation. I forgive myself that I accepted and allowed myself to react negatively to the word manipulation as a consequence of the fact I am connecting the word to past experiences, thoughts and emotions. I forgive myself that I accepted and allowed myself to see myself as a victim in relation to memories and experiences I have connected with the word manipulation. I forgive myself that I accepted and allowed myself to be manipulated in several occasions throughout my life, I therefore forgive myself that I accepted and allowed not to be my self directive principle, taking my responsibility in that moment but allowed myself to move into a situation I could not fully stand for as myself. I forgive myself that I accepted and allowed myself to be manipulated over and over again without learning from past experiences, allowing the ‘need’ for (negative) energy be more important (the energy released by feeling victim of a situation, self-blame, etc.) than common sense and taking full responsibility for my own actions. I forgive myself that I accepted and allowed myself to ‘feed’ on negative energy by maintaining alive a sense of being a victim by going back in my memory to specific situation I felt I had been manipulated and re-live again the feeling and emotions related to the realization I had been manipulated. I forgive myself that I accepted and allowed to feel negative energy connected to the word manipulation even if I could not figure out what specific point was triggering the feeling/reaction. I commit myself to not allow myself to go back into memories in order to re-live experiences but when I see myself doing so to stop, breathe and analyse the point/trigger to debunk it to stop the pattern I am in. I commit myself to stop blaming others when I feel victim of them manipulating me. Instead, I commit myself to take full responsibility in that moment of my (re-)actions, by looking at how I stand as self in that moment and how I can act in common sense and in the interest of all. This post is a continuation of post Day 58. So, after the strong reaction to the word manipulation I am having a look at the dimensions connected this word. The word triggers a whole series of reactions, images, thoughts, emotions. In order to understand my reactions to the word I will make a list of definitions in several dimensions. 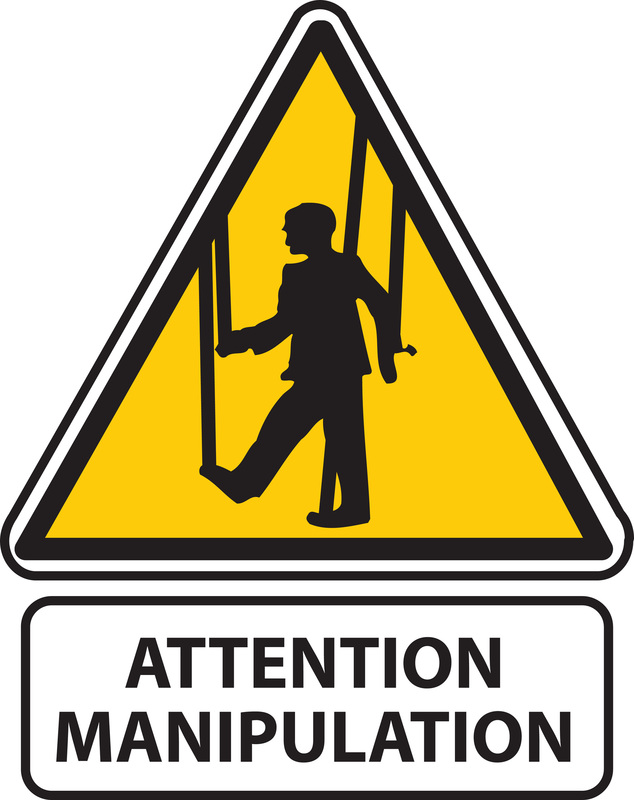 When I read or hear the word manipulation my reaction is negative. I imagine someone else that is trying to get things done through manipulating me. Since I, when I interact with people, always start from a point of trust until this is proven to be wrong, I have been an easy victim for people wanting to manipulate me. Due to experiences in the past I created negative memories related to manipulation and connected this with feeling a victim of others that were manipulating me, forcing me to do things in their interest and against mine. Even though I can’t remember specific occasions where I have been manipulated my mind is suggesting me that I had many bad experiences. The only thing left of these memories is the bad feeling, a negative emotion that apparently can exist without a real cause or reference. If I squeeze my memories in relation to manipulation I start to see a couple of topics. One of them is connected to my partner. In several occasions I felt manipulated by her when, after having done a specific thing or made a specific decision, I looked back to realize I could not fully agree with that point. In reaction to that – instead of taking my responsibility – I felt manipulated and therefore a victim. Here I see clearly that the fact of feeling manipulated and seeing myself victim of a situation is related to the fact I have done specific things or decided on specific topics without considering all dimensions in the very moment i had to do/decide. Only afterwards, when reviewing the facts, I realized that I overlooked things and went into blaming someone else like my partner for having pushed me to that point. This point of reacting to the word manipulation is therefore kind of supercharged by memories connected to emotions that have been building up and charging during my life. Not having seen/recognized the point allowed me to go into a loop over and over again when being in a situation where I was going through a reaction to the word/experience of manipulation. To stop this, to break the loop, I need to find out the triggers that connect to the word manipulation. These will lead to the memories that are creating the pattern of reactions. On top of that I need to have a look at the fact I allowed myself to be pushed into taking specific decisions or do specific things without first considering all relevant points that would lead to a action/decision done/taken in full responsibility. In the next blog I will work out the points discussed here and forgive myself in order to stop the pattern and break the negative relation to the word manipulation.